Whether as New Year's resolutions, birthday wishes, or daily promises, most everyone vows at some point to make a major life change. But change is easier said than done, especially when it comes to better managing our wellness amidst the chaos of everyday living. 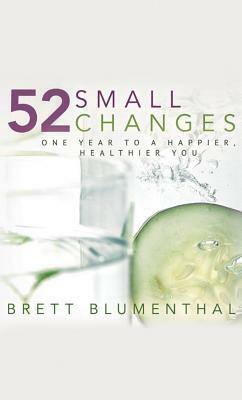 Fortunately, wellness coach and award-winning writer Brett Blumenthal has devised a way to inspire and motivate her readers to live healthier and make positive changes in their lives. Although Blumenthal's method is not a quick fix, it is a surprisingly simple one: make one small change per week, for fifty-two weeks, and at the end of a year, you'll be happier and healthier. After all, it is the small changes that are the most realistic, instead of trying to overhaul your lifestyle all at once. 52 Small Changes addresses all areas of wellbeing, including nutrition, exercise, stress management, mental wellness, and even the health of one's home environment. By guiding readers through these changes at an easy, manageable pace, Blumenthal provides an engaging roadmap to lasting results and "a happier, healthier you."